This is the first of two events this weekend. We arrived at Bentwood late afternoon, as the festivities were just getting started. This is a family event, so there were a number of children attending. The weather was quite warm, but Praise God we got several short spurts of rain that went through that cooled things off nicely. Amount the entertainment for the evening was a bull ride for the adults and a water slide for the kids. We had some problems with the Bull Ride initially, it would go around, but it wouldn’t buck. Fortunately a couple of Companeros managed to get it going. Seems there was a loose connection. As you can see from the photos, the kids really enjoyed the water slide, and Debbie said one young man said “This is the best day of my whole life”. Pretty high praise coming from a 6-7 year old. Companero Ragu volunteered for his annual Bull Ride, but I think he might have said this was his last. I wouldn’t even let Debbie try it, it looked too dangerous to me. Anyway, there were brisket tacos, a silent auction, live auction, music, and I even saw some dancing. All in all, a pretty great event. The Bandidos had their 13th annual Summer Sizzle at Ernie’s on the Lake this year, and as you might imagine, it was well attended. We arrived a bit after noon, and there were already quite a few people there. Ernie’s has quite good food, so Debbie and I shared the Fish Tacos, which was just right as a relatively light lunch for the two of us. In addition to good food, there was a silent auction, and live auction, and a DJ playing some good tunes. I brought about 25 copies of my latest book, the Monochrome edition of “UCOA: The Biker Experience”, and made them available for donations. The went fast, and I continued to receive requests, so I will be bringing another 25 to the UCOA Meeting next month. We made the rounds, saying hello, enjoying the air conditioning. Eventually we worked our way out to the deck by the water to enjoy the view. Eventually they brought everyone back inside, for twelve auction, which had some really nice items. We didn’t bid on those, but Debbie did manage to win one of the silent auction items, a little chrome clock for one of her bikes. Eventually things started to wind down, or maybe we were winding down, I’m not sure. Anyway we headed home, and stopped at the DQ on the way to cool down a bit. Definitely a good day. A friend Johnny gave Debbie a necklace made by Nikki. Nikki is an artist, and she made these to earn a little extra income. They were very nice. We attended the Summer Sizzle today at Hardtails in Georgetown. It was very well attended, and we had lots of people to talk to. It is a benefit that helps to support the J.W.Rock Foundation, where we provide Christmas food baskets and presents to the most needy at Christmas time. I think everyone was having a great time. We had out monthly UCOA meeting this evening, and though the weather was kind of wet, we still have a good turnout. The new UCOA web page (CLICK HERE) is up, and there are lots of events coming up, so be sure to check the new calendar (CLICK HERE) as well. 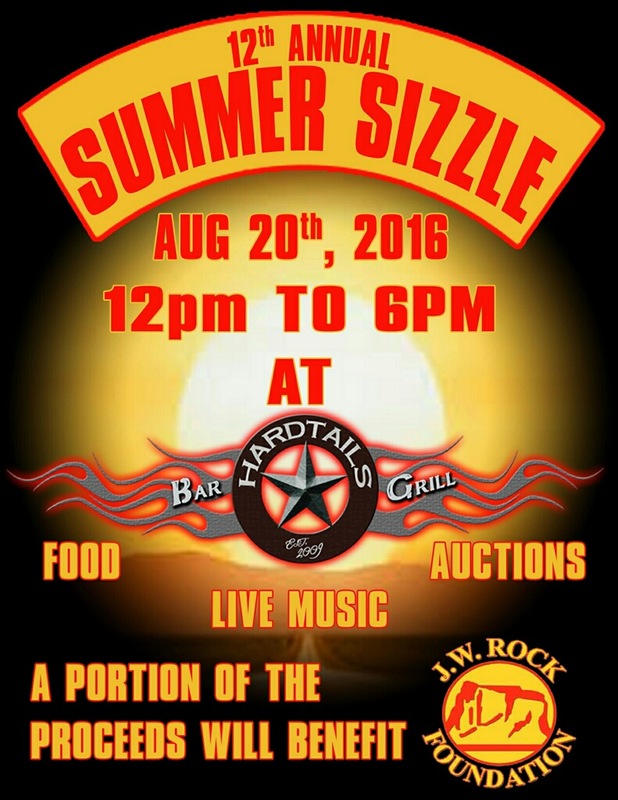 In particular this Saturday is the Summer Sizzle at Hardtails in Georgetown. See the flyer below.